With people keeping their vehicles for longer periods of time, comes an increased demand for automotive service centers that perform preventative maintenance and automotive repairs. 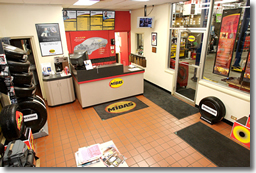 Midas is a trusted brand that consumers turn to for a wide range of automotive services and our service centers are a one-stop shop for total car care including tires and oil changes. As a Midas franchisee you'll be well-positioned to capitalize on the strong demand for automotive services and build long-term relationships with customers who want convenient, cost-effective car care. You'll operate a recession-resistant business that virtually everyone has heard of - the Midas brand boasts 97% consumer recognition- which provides you with a significant competitive edge in the marketplace. "At Midas we go the extra mile to meet our customers' needs. We will meet customers early or late; our techs get to know our customers—we cultivate personal relationships with customers." "Midas is much more affordable alternative to the dealership and we do most of our services while the customer waits—at a dealership you have leave your car all day." A new franchisee orientation and training program that includes classroom instruction and hands-on training. Ongoing training - E-learning, self-study and regional seminars help you make your franchise as efficient and productive as possible. Extensive marketing and operations support from an experienced and dedicated staff. Operations manuals and guides to help guide you through every aspect of the business. Proven systems, including an Intranet site that provides you with access to reports, bulletins, shop and account data, as well as a wealth of resources. Please note interested parties should have at least $50,000 to invest. This information is not intended as an offer to sell, or the solicitation of an offer to buy a franchise. It is for information purposes only. An offering is made by prospectus only. 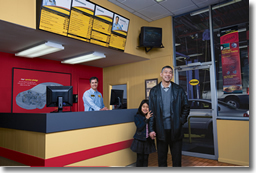 Click on Request Information for FREE info on how to open a Midas franchise today! Please Note: This Midas franchise opportunity and other franchise business opportunities, businesses and franchises for sale on this web site are not to be considered as an "offering", "franchise offering", suggestion or recommendation by Franchise Leader™. This advertisement depends entirely on the truthfulness of the information provided by our advertisers which includes, but is not limited to, franchisers, franchise brokers, franchise consultants and business brokers. Franchise Leader™ recommends that you consult a lawyer, financial consultant, accountant or professional advisor before buying a franchise or business opportunity or any type of business. By using this form or any part of our website, you have agreed to all terms and conditions of Franchise Leader™. Please review our Terms & Conditions for more information.